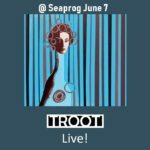 TROOT and Echotest Live @ Seaprog in June! We’re super excited to be included in the lineup for this year’s Seattle Progressive Music Festival. Can’t wait to see you there! The dynamic 10-piece ensemble known as TROOT, brings together exceptional musicians from around the world to record the intricate Chamber-Prog of composer Tim Root. This is a true super-group of talent bringing together Julie Slick & Alessandro Inolti (Adrian Belew Power Trio, Echo Test), Marco Machera (Echo Test), Steve Ball (Tiny Orchestral Moments, Electric Gauchos), Beth Fleenor (Crystal Beth and the Boom Boom Band), Amy Denio (Kulture Shock, The Tiptons), Nora Germain, Alex Anthony Faide (Electric Gauchos, Los Twang Marvels) , Bill Horist along with Tim Root on Piano. Episode 2 (Meet the Trootians, Part I) is a brief introduction to Marco Machera, Alessandro Inolti, and Julie Slick of the TROOT band. You will meet Julie, Marco and Ale backstage at Seattle's Substation just before their February 2018 "Echotest" show, describing their involvement in the TROOT project. Thank you to everyone who joined us on PledgeMusic and became part of the story of this music! Our supporters will be the first to hear the record in it's finished form, and along the way they received special supporter-only updaters and sneak-peeks. Most importantly though, they helped make this record a reality. We couldn't have done it without each one of our supporters. Here's the video we used to launch the campaign! Thanks!